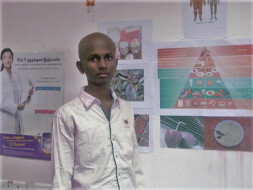 My name is Murughaiah and I am working as a helper in electricity department of Tamil Nadu.My son Sivan is diagnosed with Acute Myeloid Leukemia(Blood cancer) at the age of 16 years.He has been taking treatment in Meenakshi mission hospital & Cancer research Institute, Madurai. My wife is dumb by birth. She has been seeking help from our relatives but in vain. With my little income, I have been supporting his treatment till now.During our visit to hospital last month, Doctors told us about the cure i.e, Bone Marrow Transplant. Sivan sister is a half matched donor and doctors are preparing her to collect stem cells. We are trying hard to raise fund. Since the amount is huge we seek your kind support to save my grown up son. Myself Surya Kiran along with the team of helping hands from Madurai is supporting the cancer affected kids through milaap campaigns. Recently we have concluded two campaigns for saving two small kids Dhakshadha & Madhumitha. Currently both are undergoing BMT at Meenakshi Mission Hospital, Madurai.This is the third case referred to us by MMH. Young boy Sivan is a brilliant student, doing plus two and is a curse came this monster in to his life. 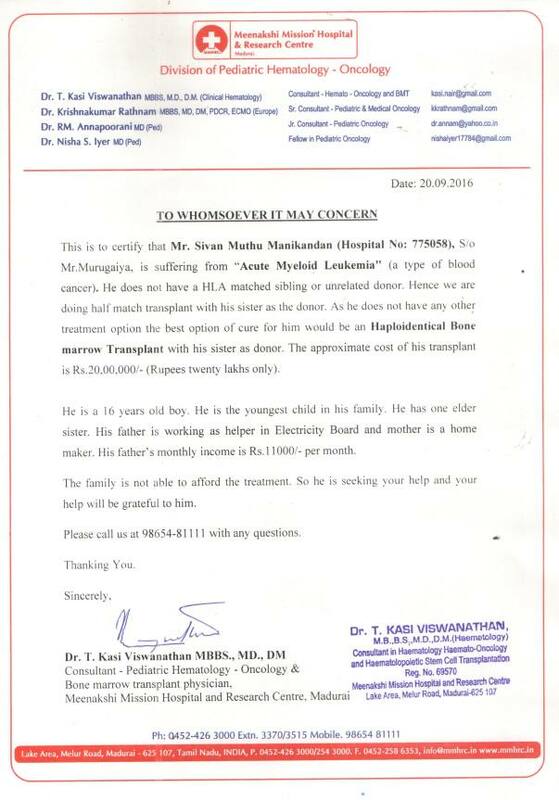 Below middle class family with financial constraints can`t bare such a huge sum of 20 lakh required for treatment. the family is in a dire straits and seeking support from all of us, So Kindly understand the need and come forward to save sivan life from cancer. Your little donation is worth a life!!!! Let`s all bring hope and smiles in sivan`s life. I am Uthra Nagarajan, a Milaap Fellow. I recently spoke to Aruna, social worker at Meenakshi Mission Hospital where Sivan Muthu is being treated. Sivan Muthu’s doctors are conducting tests for the best stem-cells donor match for him. His mother is not a compatible donor, so now they are testing his sister for compatibility. The results are yet to come. “Sivan Muthu’s parents are hoping for the best. Based on the results, the doctors will take a call on the transplant procedure,” said Aruna. Sivan Muthu is continuing his chemotherapy sessions once a week. He is admitted in the hospital for the sessions and his condition is stable for now. Once a bone-marrow match comes through, his transplant procedure will be carried out immediately.